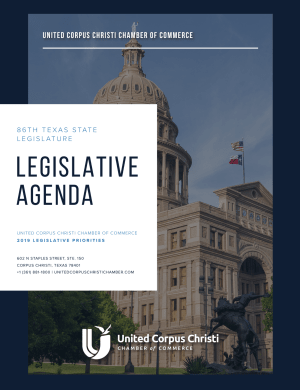 The United Corpus Christi Chamber of Commerce Government Affairs Committee is an advisory group made up of Chamber business members that develops public policy positions for the Board of Directors to consider. The committee will only consider positions that are consistent with our chamber’s values, principals, and policies established by the Board of Directors. The chamber hosts three events to enhance and implement the work of the Government Affairs Committee. 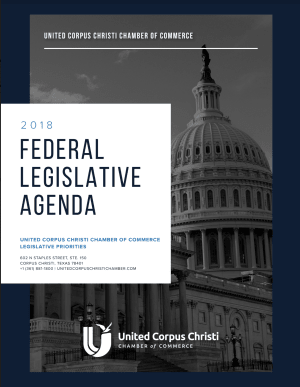 For more information about any of these programs or the work of the Government Affairs Committee, contact Ginny Cross, VP of Government & Community Relations, by email to ginny@unitedcorpuschristichamber.com. An annual multi-day trip to Washington, D.C. The delegation takes the chamber’s federal legislative agenda to DC to advocate on behalf of our business community. Meetings are scheduled with key decision makers on Capitol Hill and targeted to address specific issues represented on our agenda. This is our opportunity to take the Coastal Bend to Washington! A day to take the Corpus Christi to the State House. This event is held in conjunction with the State legislative session every other year. It offers specific meetings with our delegation and features a reception for all legislators. It’s a great day to represent our community in Austin. A great outdoor event hosted annually as an opportunity to meet and greet all elected officials and candidates from all areas of representation; federal, state and local are all invited to participate. Connecting elected officials and candidates running for office with our local leadership and members.